Carmen got the jeans at a thrift shop. They didn't look all that great: they were worn, dirty, and speckled with bleach. On the night before she and her friends part for the summer, Carmen decides to toss them. But Tibby says they’re great. She'd love to have them. Lena and Bridget also think they’re fabulous. Lena decides that they should all try them on. Whoever they fit best will get them. Nobody knows why, but the pants fit everyone perfectly. Even Carmen (who never thinks she looks good in anything) thinks she looks good in the pants. 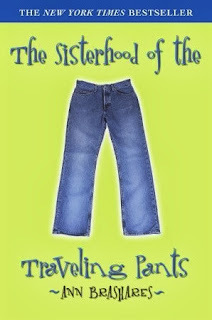 Over a few bags of cheese puffs, they decide to form a sisterhood and take the vow of the Sisterhood of the Traveling Pants . . . the next morning, they say good-bye. And then the journey of the pants — and the most memorable summer of their lives — begins. This was one of my favourite books as a pre teen, and still as a teenager. It talks about friendship in the best way possible and bonds between friends that cannot be explained. The book is so different from the conventional pre teen novels which seem to settle on the fixed stereotypes of to be teenagers in the US; One being the mean chic prom queen whose looks cover up for her disgusting personality , and at the other the nerd who wants and fantasises about her prince charming but who is ignored by the entire school. This book talks about the OTHER personalities in schools. YES, they do exist. The book is about four best friends, who are different from each other as possible but are still closer than ever. They share everything and can count on each other all the time. Their mothers were together since their pregnant days and that is when they began to be besties. At birth. They have grown up together, and at the beginning of the summer that they are spending apart for the first time, they find a pair of jeans that magically fits them all despite the difference in their sizes. Lena is off to Greece to meet her grandparents; Carmen to spend some quality time with her divorced dad in South Carolina; Bridget to Baja, California for summer camp and Tibby, the impotent rebel is stuck at home, cutting a minimum wage at Wallman’s. They decide to share this magical pair of pants along the summer, passing it from one another at the right time. As the lengthy summer unravels, the pants become a source and symbol of the generous support to each of the girls of her absentee best friends showing that although they were far apart in distance, never in heart. This book is filled with tongue in cheek humour, energy and the excitement is the perfect book to read or gift no matter what your age maybe. The books shift perspective from one girl to another as they deal with ‘typical problems’ of a teenager. One of the best coming-of-age books in a long time, it’s a must read for all pre- teens, teens or anyone who just wants to relive those summer days. It’s a tough world out there, but with friends like these, life becomes slightly easier!